This Panerai Radiomir is a limited-edition timepiece and is 1 of only 1000 made, it comes complete with its original box and papers. The ‘Marina Militare’ dons a faux patina on the oversized Arabic numerals and hands to give the timepiece a vintage appearance. Like most of Panerai’s historical homage watches, this timepiece has a manually wound movement. This limited-edition timepiece comes complete with its original box and papers. Brevetatto, the Italian for patented, is inscribed around the outside of the sapphire caseback and refers to the watch’s design, which adheres to a vintage aesthetic. The ‘patented’ itself is with regards to the 12-sided shape that Panerai have used for the caseback. On other limited-edition Panerai watches the ‘brevetatto’ is inscribed around a 12-sided bezel instead. This Panerai has undergone a thorough inspection of water resistance, accuracy, functionality and condition to determine the level of reconditioning required to meet our strict standards. It has also been referenced against technical documents and manufacturer records where available to ensure authenticity and a clean history. 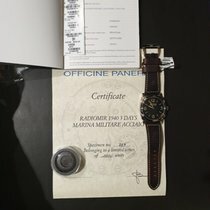 This is a pre-owned Panerai Radiomir Manual PAM00587. It has a 47mm Steel case, a Brown dial, a Leather - Brown bracelet, and is powered by a Manual movement. The case has a OP69xxxxxxxxxxx serial and paperwork is dated 10 November 2014, making it 5 years. It originated in Italy, and comes complete with box. It is also supplied with a comprehensive 12 month Watchfinder warranty.